Ectopic production of immunoreactive human chorionic gonadotropin (beta-hCG) has reportedly been found in a variety of nontrophoblastic neoplasms including large cell carcinomas of the lung, gastric carcinoma, renal cell carcinoma and hepatomas. We report an unusual case of a gonadotropin-producing sarcomatoid adenocarcinoma of the esophagus that manifested as gynecomastia. A 69-year-old man presented to his primary care physician in December 2016 for evaluation of bilateral tender gynecomastia without any history of breast mass or injury. Examination did not show any focal masses. There was no history of dysphagia, weight loss or other constitutional symptoms, and no history of testicular swelling, pain or masses. A testicular examination and ultrasound revealed no anatomic abnormalities. Prostate examination was normal. A thorough lab workup for gynecomastia revealed a beta-hCG level of 3520. The patient underwent a computed tomography (CT) scan of the chest, abdomen and pelvis, and distal esophageal wall thickening was seen along with adjacent adenopathy. A subsequent esophagogastroduodenoscopy (EGD) revealed Barrett’s esophagus with an ulcerated lesion at the gastroesophageal junction. Biopsy of the lesion showed poorly differentiated adenocarcinoma with sarcomatoid features. Tumor cells were positive for cytokeratin-7 (CK7), pan keratin, and p40, and negative for CK5/6 and HER2. F-18 fluorodeoxyglucose (FDG) demonstrated paratracheal and paraesophageal lymph node involvement, a 1.3-cm left lower lobe metastasis, and a right upper lobe metastasis too small to characterize (Figure 1). As there was no dysphagia, the patient underwent 4 cycles of cytotoxic chemotherapy with 5-fluorouracil and Cisplatin for his stage IV cancer. 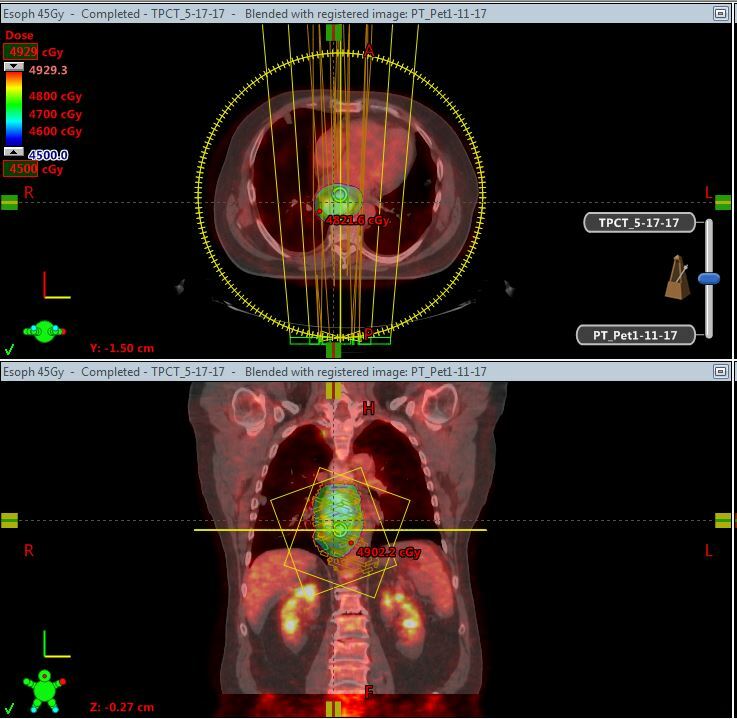 After 4 cycles of chemotherapy, follow-up positron emission tomography (PET) showed continued growth of the esophageal and lung lesions, and his beta-hCG had increased to 16397. During chemotherapy the patient developed erythema and watering in his right eye, and was diagnosed with uveitis. He attempted a trial of steroids but did not improve. He underwent a fine-needle aspiration of his right eye in April, which showed atypical glandular cells, confirming metastases of the adenocarcinoma to his eye. A magnetic resonance imaging (MRI) exam of the brain was performed to rule out brain metastases and pituitary involvement and showed normal brain tissue, but areas of decreased signal in the right frontal and left parietal bones; these findings were not seen on CT or PET studies. He received laser cyclo-photocoagulation, intraocular Avastin, and palliative radiation of 3060 cGy, which improved symptoms but caused blurred vision. This was appropriately correctable with a contact lens. A repeat EGD was performed, which demonstrated persistence of the nearly obstructing tumor. His chemotherapeutic regimen was switched to FOLFIRI (FOL = Leucovorin Calcium [Folinic Acid]; F = Fluorouracil; IRI = Irinotecan Hydrochloride) and he elected to undergo palliative radiation of his esophageal tumor. His beta-hCG subsequently improved to 2031, but a follow-up PET-CT after the cycle showed progressive worsening of his pulmonary metastases. He was then started on Cyramza and Paclitaxel. His right eye became progressively painful and he elected to undergo enucleation in November, which revealed a recurrence of the cancer in his eye. A sample of a lung lesion was taken and sent for genomic studies. At this time, the patient had developed progressively worsening dyspnea and his beta-hCG had regressed to 9490. He developed a malignant pleural effusion and received a pleural tube. The genomic studies showed amplification of ERBB2, BRCA1 rearrangement of intron 19 and tumor mutation burden of 16 muts/MB. The patient elected to undergo treatment with Pembrolizumab, but died a week following initiation of treatment, one year following his initial presentation. This is an unusual manifestation of a paraneoplastic syndrome resulting from an esophageal sarcomatoid adenocarcinoma. Gynecomastia as the presenting symptom of this tumor type has not been reported in the literature. This case has unique features in both the initial presentation and the presence of ocular metastases. Histologic reports of beta-hCG producing Barrett’s adenocarcinomas of the esophagus have been reported,2 as well as gonadotropin-producing adenocarcinomas of the pancreas, stomach and prostate. Elevated levels of beta-hCG are usually a sign of aggressive disease and are strongly associated with a poor prognosis. Elevated beta-hCG production in some adenocarcinomas has been shown to increase expression of vascular endothelial growth factor and may contribute to the aggressiveness of these tumors. Elevated levels of beta-hCG can be observed in 45% to 60% of patients with biliary and pancreatic cancer3 and 18% of gastric carcinomas. The prognosis of metastatic esophageal cancer in any form is poor and carries a 5-year relative survival rate of 4.5%.4 A case of gonadotropin-secreting esophageal carcinoma containing an unusual histologic combination of adenocarcinoma and choriocarcinoma was also reported.5 The patient in that case developed gynecomastia as well, but metastatic spread involved the choriocarcinoma and ultimately contributed to his demise. There are very few reported cases of esophageal carcinoma with metastasis to the orbit. Survival rates have varied across studies, with mean survival time ranging 7.4 months to 1.3 years.6 Metastases account for 7% of orbital tumors, with the breast and prostate as the most common primary sites. Braunstein GD. Gynecomastia. In: Harris JR, Lippman ME, Morrow M, Hellman S, eds. Diseases of the Breast. Philadelphia, PA: Lippincott-Raven, 1996:54. Couvelard A, Paraf F, Vidaud Dm et al. Human chorionic gonadotrophin beta expression in malignant Barrett’s oesophagus. Virchows Arch. 2004; 445(3):279-284. Stenman U H, Alfthan H, Hotakainen K. Human chorionic gonadotropin in cancer. Clin Biochem. 2004;37(7):549-561. National Cancer Institute. Surveillance, Epidemiology, and End Results Program. Cancer Stat Facts: Esophageal Cancer. https://seer.cancer.gov/statfacts/html/esoph.html. Accessed February 17, 2018. McKechnie JC, Fechner RE. Choriocarcinoma and adenocarcinoma of the esophagus with gonadotropin secretion. Cancer. 1971;27:694-702. Ferry AP, Font RL. Carcinoma metastatic to the eye and the orbit I: a clinicopathologic study of 227 cases. Arch Ophthalmol. 1974;92:276-286. Moser C, Stokes SH. Esophageal adenocarcinoma presenting as gynecomastia. Appl Rad Oncol. 2018;7(1):56-57. Mr. Moser is a fourth-year medical student, and Dr. Stokes is a radiation oncologist, Southeast Alabama Medical Center, Dothan, AL. Disclosure: The authors have no conflicts of interest to disclose. None of the authors received outside funding for the production of this original manuscript and no part of this article has been previously published elsewhere.